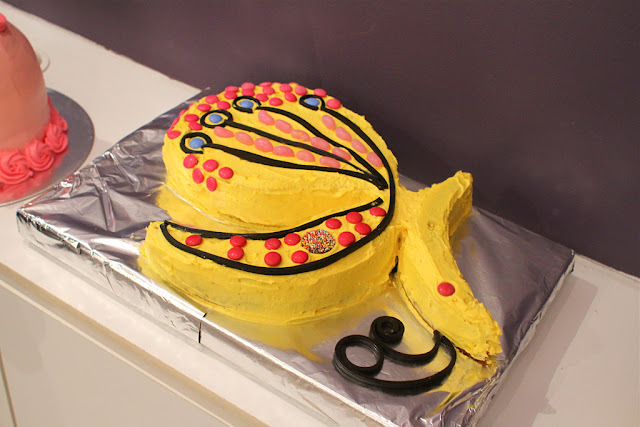 The theme for the September Clandestine Cake Club in Perth was Retro/Childhood cakes, bringing much nostalgia for the Australian Women's Weekly Children's Birthday Cake Books which played a special part in the lives of many kids growing up in the 80s and 90s. Most people I know have had a birthday cake made from these books. My mum isn’t much of a baker. All my birthday cakes where store bought from the Asian bakery. Asians like those light fluffy chiffon style sponge cakes with layers of whipped cream and fruit. That was the standard cake that everyone in my family got for their birthday. Look at my face! I’m shocked…hmm maybe my expression wouldn't be like this if I had a birthday cake made from the Australian Women's Weekly Children's Birthday Cake Books?!.... Where’s my train? Choo Choo! Without a precious childhood cake memory, I had to go a bit retro. 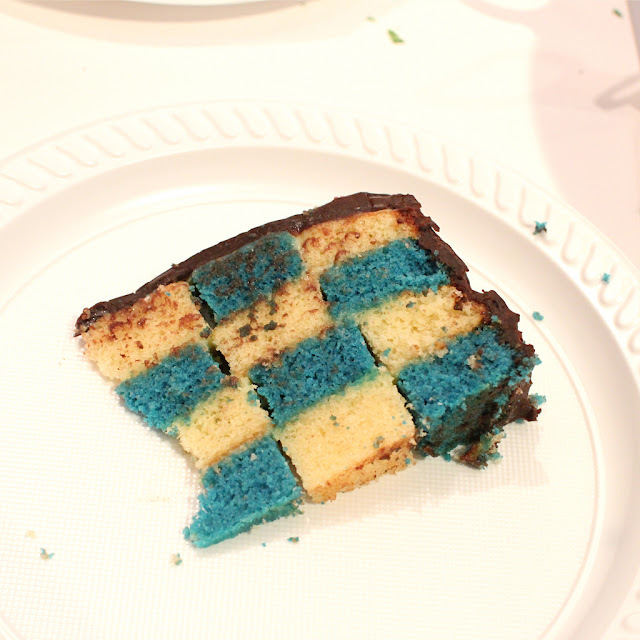 Looking though a number of different cake recipes, the one that caught my eye was a checkerboard cake. It has a certain wow factor. It looks like it would be quite difficult to make. How do you get the checkerboard pattern? It must be magic…well I’m sure that’s what I would have thought if I had received such a cake for my birthday as a kid. It’s magic! When it comes down to it, it’s not really a hard cake to make. You just need to plan ahead and it will take a bit of time to put together but the end result is worth it. It was interesting for me to learn that the checkerboard pattern was made up of concentric circles, layers of bullseye targets stacked on top of each other. 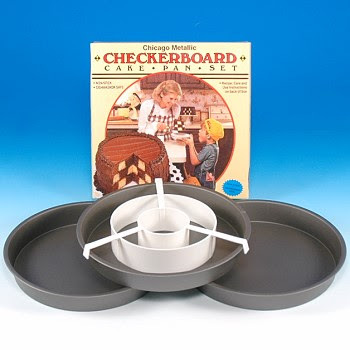 You can buy special vintage checkerboard cake pans that have circular dividers to fill with alternating coloured batter, but who needs another cake pan? I don’t. Well my kitchen doesn’t. My kitchen cupboards are like a game of Jenga. I keep carefully slotting in more plates, pots and gadgets into every nook and cranny. Everything has its place. I use something, wash it and then put it back where I took it. If I placed it anywhere else, it would disrupt the balance and I’m sure everything in my kitchen would come crashing down. I prefer the DIY method which involves baking different coloured cake layers and cutting the circles out by hand, using a knife and tracing around a small plate. Then the inner circles between the different coloured cakes are swapped with white ganache cementing the layers together. 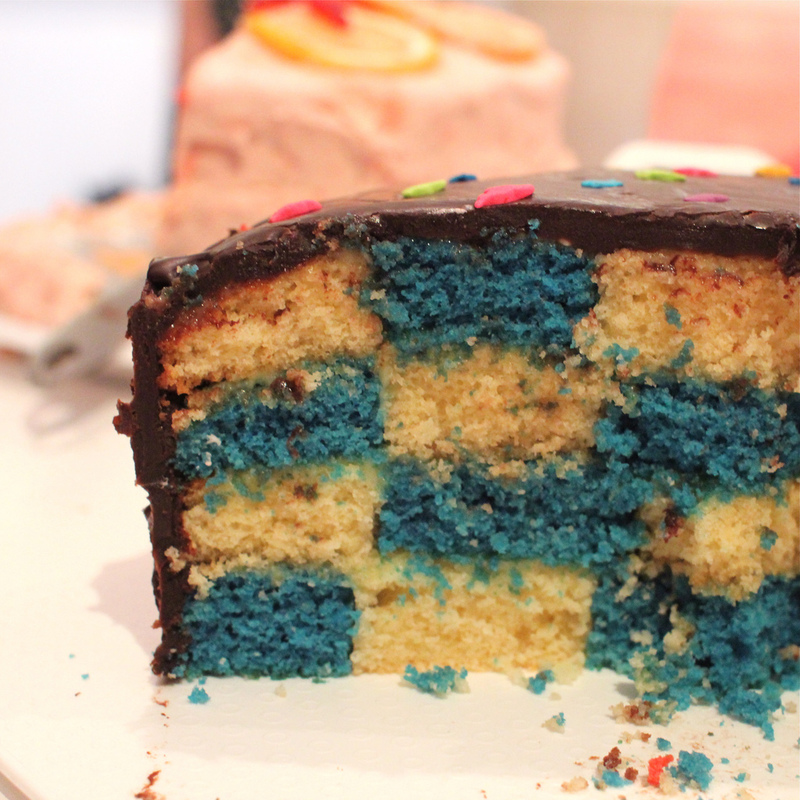 I was excited about putting the checkerboard cake together on the Saturday morning of cake club. I had baked the cake layers the night before and refrigerated them, as it’s easier to cut and assemble it cold because the cake won’t crumble as much when you cut the circles and layer them. I usually don’t bake cakes that require so much construction so I was proud that I had put myself up to the challenge. 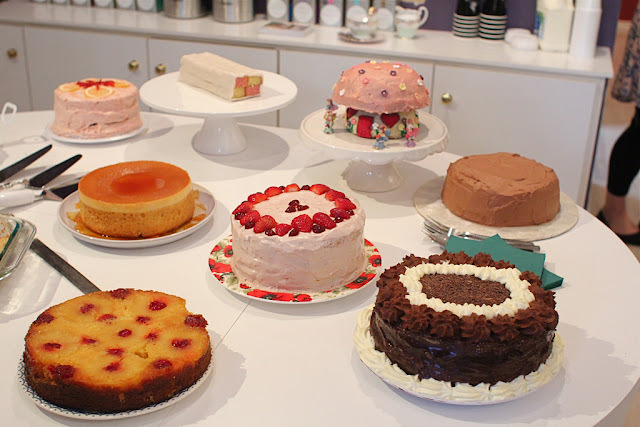 That’s one of the great things about cake club, it gives you an opportunity try baking a cake that you have never made before and share the results, good or bad, with other cake clubbers. It’s not a contest, there is no backstage cake sabotage and stories of cake catastrophes are welcome. Sometimes people bring a cake that they have had a few issues with making and when they confess their failures, it’s like an alcohol anonymous meeting, where everyone is nodding their head in agreement and can understand exactly what went wrong, we’ve all being through it and yet the baking addiction continues. 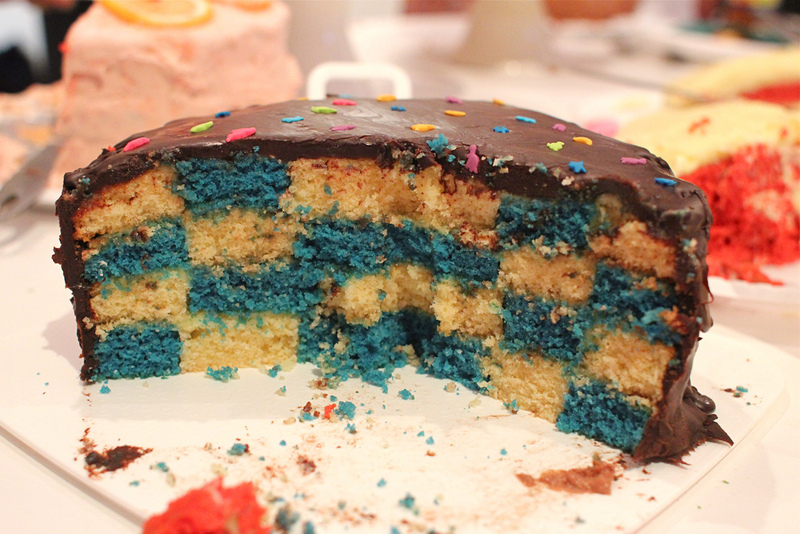 I had no idea if I had been successful with the checkerboard effect until I cut into the cake at cake club. 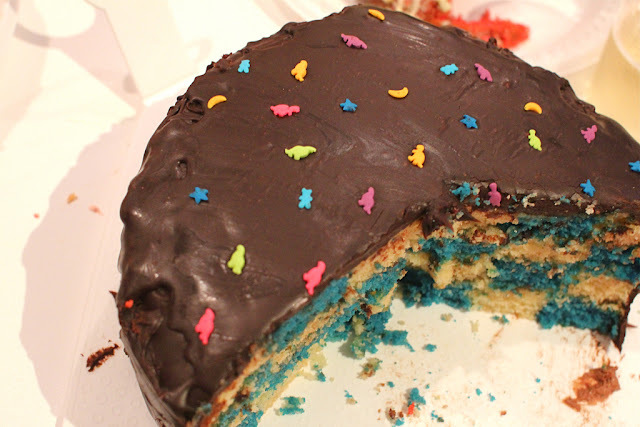 Hence, I had covered my whole cake in dark chocolate ganache and finished it off with some dinosaur sprinkles, so if all else fails, there was chocolate and dinosaurs are cool. I like the anticipation as you cut into a checkerboard cake, everyone was just as excited as I was to see the inside of my cake. Luckily it turned out well, much better than I had expected. Everyone was impressed. I pretty much used this checkerboard cake recipe from the blog Raspberri Cupcakes which has lots of great tips and some step-by-step photos. I whipped up a basic vanilla cake recipe and divided it into two bowls. I originally wanted to make vanilla and chocolate layers but since I had some leftover blue dye from a previous Apocalyptic cake endeavour I decided to use it for the alternating layer. 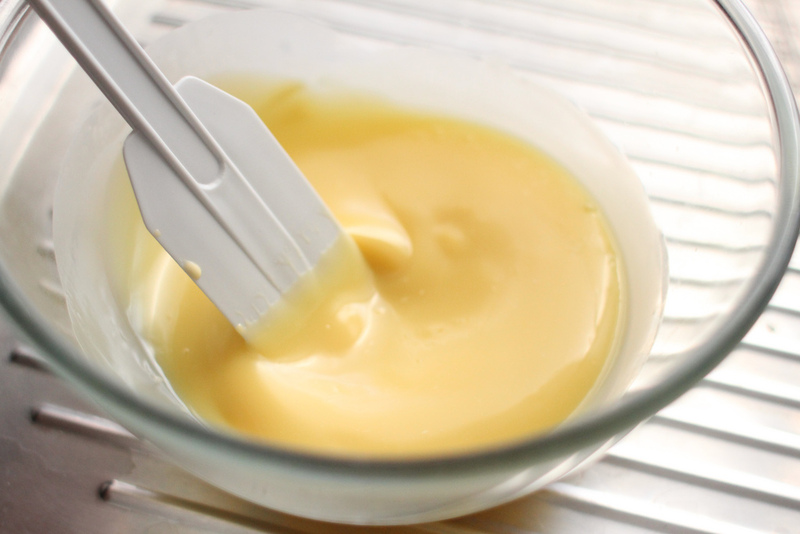 After all, food dye is very retro, back in the day when artificial colours were all the rave, we weren’t so hung up on E numbers, process food was eaten religiously and the microwave was your best friend. How times have changed…these days you can’t mention eating processed food or using a microwave to cook with, without people looking at you like you have committed a sin and judging you for having bad taste. 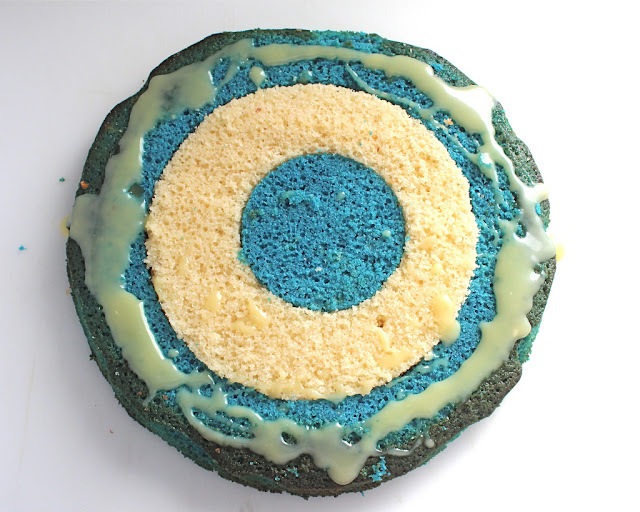 When I tweeted some photos the morning that I was putting the checkerboard cake together, I had some people asking if I was making a Smurf cake or maybe an Eagles edifice? 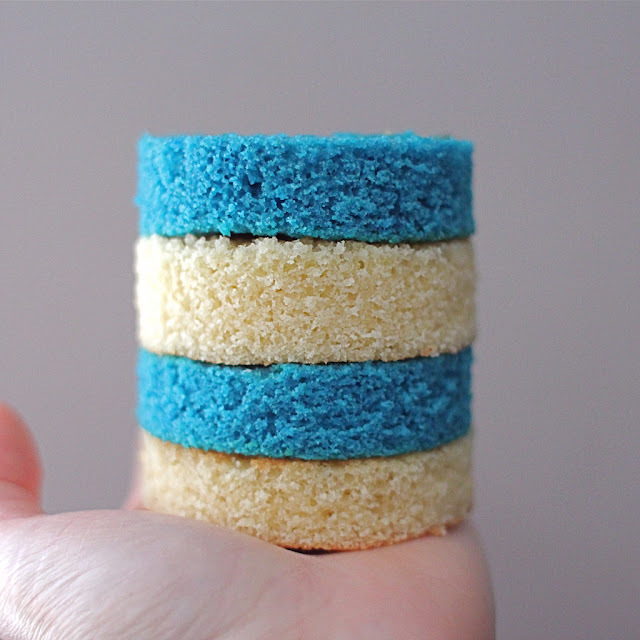 No, my cake was coloured blue because my favourite colour is blue. There aren’t many foods that are naturally blue. Most people would be turned off if they saw blue food because it’s a sign that the food is spoilt. In fact, a Japanese company has created blue glasses to sell as a dieting aid on the premise that if you see food through blue coloured lenses you won't want to eat much because it would look unappetising. Alfred Hitchcock was famous for throwing a dinner party where he served all his guests food (martinis, steaks, peas, and mashed potatoes) that had been dyed blue, Very little was eaten and guests were repulsed and left. I am probably one of the few people in this world who would think that it was actually cool and happily eat ALL the blue foods. What about you? 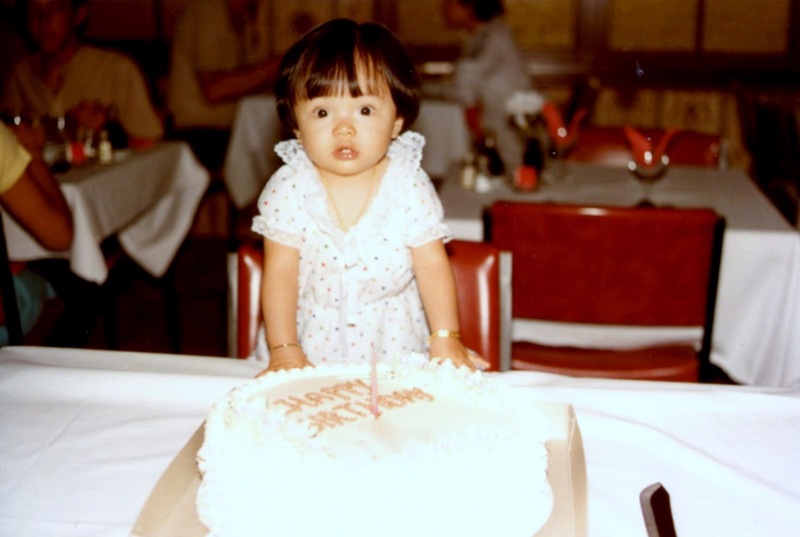 While I didn’t have a childhood story to back up my cake, I loved hearing the stories behind the cakes that other Clandestine Cake Clubbers brought. 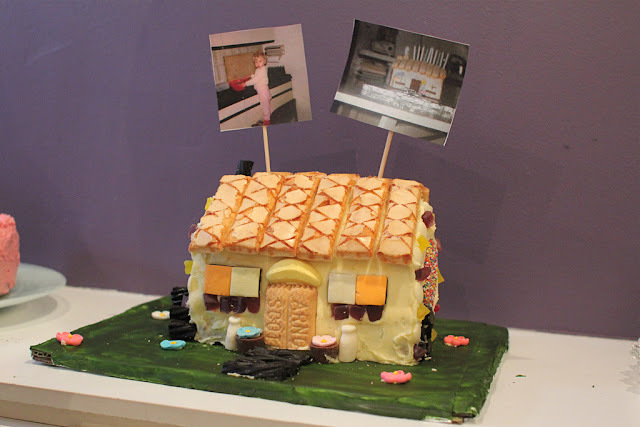 I loved the story behind this Gingerbread house where the lady remembered that she used to bake this cake with her mum when she was young and got her mum to send her some photos so that she could recreate it. I love the fact that she stuck the photos on top of the cake and you could see the past and the future together. 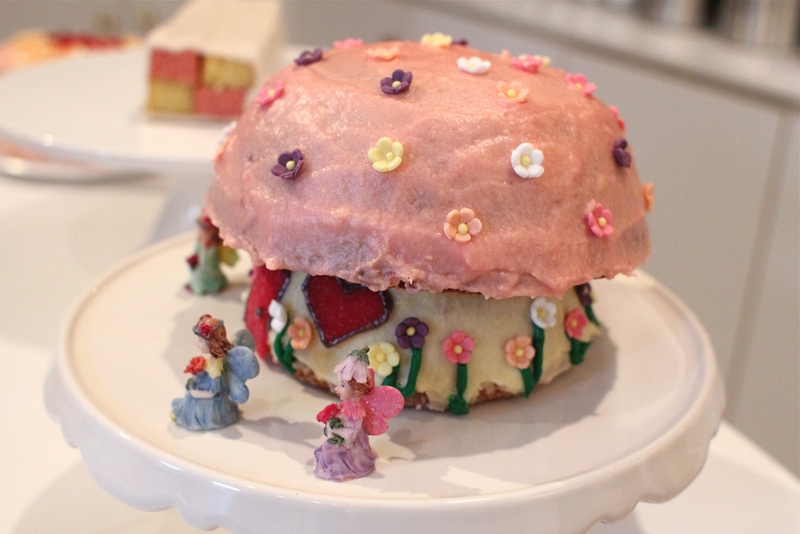 One girl made a Toadstool cake from the Australian Women's Weekly Children's Birthday Cake Book. She owned the same fairies which featured on one of the covers so she was destined to make the cake and use the fairies. A beautiful butterfly cake, straight from the Australian Women's Weekly Children's Birthday Cake Book. It was funny to hear from the lady who made the cake that she usually outsourced all the cake making duties for her kids but made an effort to bake for cake club. Hi Barbie! 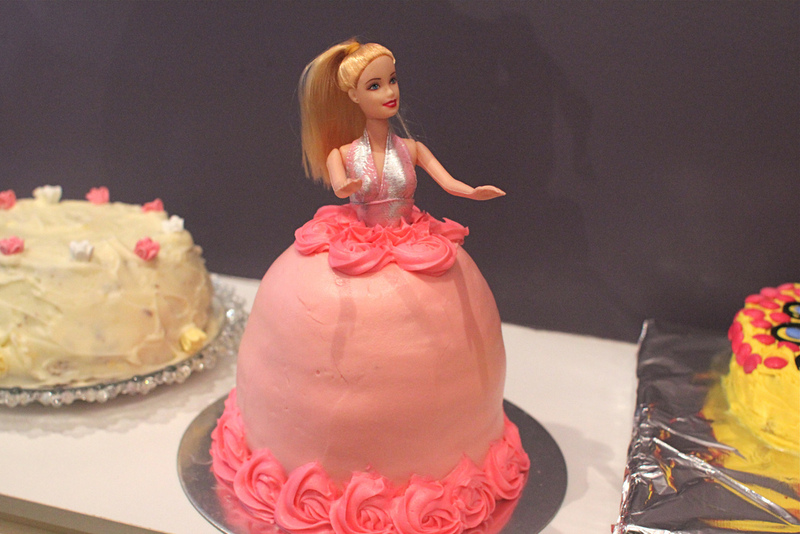 It would not be a party without a Barbie cake right? The lady who made it told us how as a kid she got freaked out when she cut into the cake and found that Barbie had no legs! australian women's weekly cakes? I didn't know the had books just for cakes. my mum would just buy us the vienetta or ice cream cake from the freezer section. Not big cake eaters in my family. your cake turned out well. I always wondered how the checker effect was made and now I know. 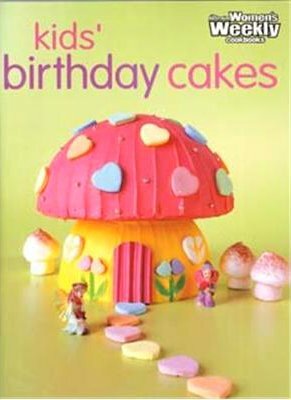 I didn't really know much about these birthday cake books either and the impact it had until I went to the Clandestine Cake Club and heard peoples stories. Ok so this cake of yours is pretty freakin' awesome, but it is nothing compared to that photo of you. CLASSIC. My mum had that book, I got a beehive one year for my birthday. I still think it was the best cake I have ever had. What a great article guys! I also produce great kid's cakes for sale for birthday parties, etc. Check out http://cakeflaire.com.au for more info if you're interested. Thanks! Farewell Morning Tea. Hello Part-Time Work.